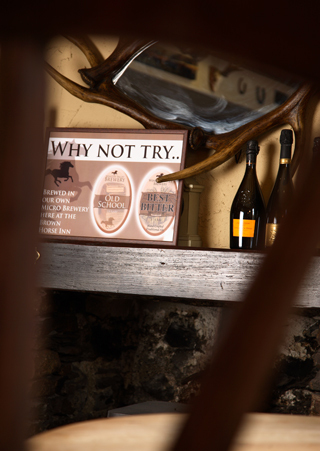 Nestled in the heart of the Lake District in the Winster Valley that gives this tiny village its name, lies The Brown Horse, a coaching house from the 1850s that has been lovingly restored to offer fine food and accommodation to tourists and locals alike. This family-run inn is a real retreat from the hustle and bustle of nearby Bowness, offering panoramic views and the often overlooked luxury of pure peace and quiet. Each of the nine en-suite bedrooms offers stunning views across the valley, with the original large windows in our room allowing us to gaze out over the fields from the comfort of our own bed. Access to the rooms is through a reception area at the back of the main building, and their location means there is very little noise coming up from the inn itself, which is in keeping with the premise of offering a peaceful environment in which to relax. Our room was spotlessly clean with an enormous bed, well equipped but avoiding the trap of cramming the place full of furniture and knick-knacks. While there was a temptation simply to stay in the room and enjoy the view, we ventured out down the secluded lanes of the village, where some beautiful walks can be started. From there it was back to the beer garden and the first chance to sample one of the gins for which the inn is becoming renowned, with the current menu offering more than 170 variations. Yes, 170. The Brown Horse has also branched out and brews its own beer, with a large selection of drinks available for any discerning customer. 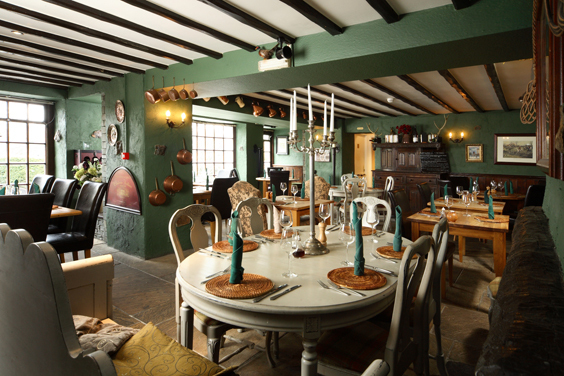 Given the beauty of the inn and the village, we were delighted not to have to go any further for our dinner than downstairs to the dining room, which has been decorated tastefully, moving it into the 21st century without losing the character and charm that one can imagine it had in olden days. We found all of the staff friendly and knowledgeable, and though on this particular evening the restaurant wasn’t hugely busy, our waitress took the time to look after us throughout our meal, always on hand should we have needed her. The menu included an impressive selection of nibbles and starters to get us under way, with a healthy number of mains on offer, without packing in too many options. My wife’s choice of prawn and crayfish salad with homemade bread proved a wise one, with the salad packed with crayfish, rather than the desultory one or two for show that can often be the case. While that was tasty, my haggis and Stornoway black pudding Wellington with whisky cream was so tasty I could happily have eaten it over and over again, erring as it did on the right side of being too heavy and greasy, and making for a delicious start to my meal. As an escape from too much meat in my meal, and also because I’m hopeless at cooking it myself, I opted for the wild mushroom and spinach risotto, which also featured some beautifully fresh peas, and the risotto was, crucially, still al dente, making for another excellent dish. My wife showed no such restraint on the meat front and had the dry-hung Hereford rump steak with homemade onion rings, chunky chips, tomato, mushrooms and garlic butter. Each of the components came together well, the steak cooked as ordered medium-rare, which was particularly important given the huge chunk of steak that dominated the dish. The onion rings and chips were crisp and satisfying, and the mushrooms full of flavour, making this a simple yet effective and much appreciated dish. The only downside of the starters and mains was that they left us with little room to sample the deserts, and that disappointment was exacerbated when we found out that the tempting mango cheesecake on the menu had been polished off by some other lucky diners. No matter, we sensibly opted for the ‘lighter’ option of ice creams and sorbets, with flavours including plum and damson, ginger and caramel, champagne and mango, which finished off our meal in a most satisfactory manner. After such a feast, our comfy bed and a quite night’s sleep was a blessing, but that didn’t stop us having the appetite for the following morning’s breakfast, whether that be the smoked salmon and scrambled eggs, or the Full English, complete with the aforementioned black pudding, and again, we found nothing that we could grumble about. Which some might say is quite an achievement where I’m concerned. All of which rounded off a fantastically relaxed stay, and for anyone wishing to visit the Lakes, I would heartily recommend The Brown Horse, either as a base to travel from, or simply as a retreat all of its own. 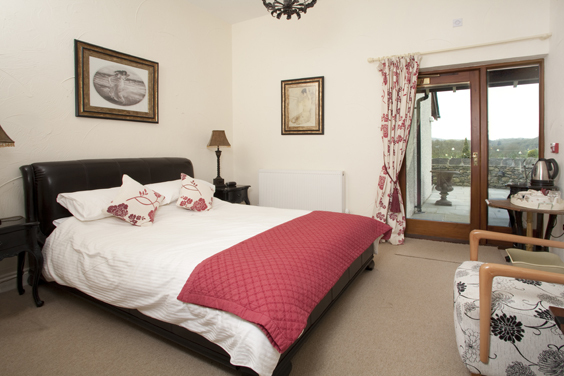 There is also the option of self-contained holiday cottages on offer as well as the rooms in the inn, and we would happily stay there again without a moment’s hesitation.